Multiple individuals who participated in the the United Conservative Party’s 2017 leadership vote say they’ve recently been questioned by RCMP investigators. Two individuals whose names appear on a list attached to phony e-mail addresses, as well as a third individual, one of Jason Kenney’s campaign workers, who says he supplied membership applications to high-ranking members of Kenney’s leadership team, all confirmed to PressProgress they’ve been questioned by RCMP investigators in recent weeks. Those who have been questioned by the Mounties indicated at least three separate RCMP officers have been directly involved to the case. 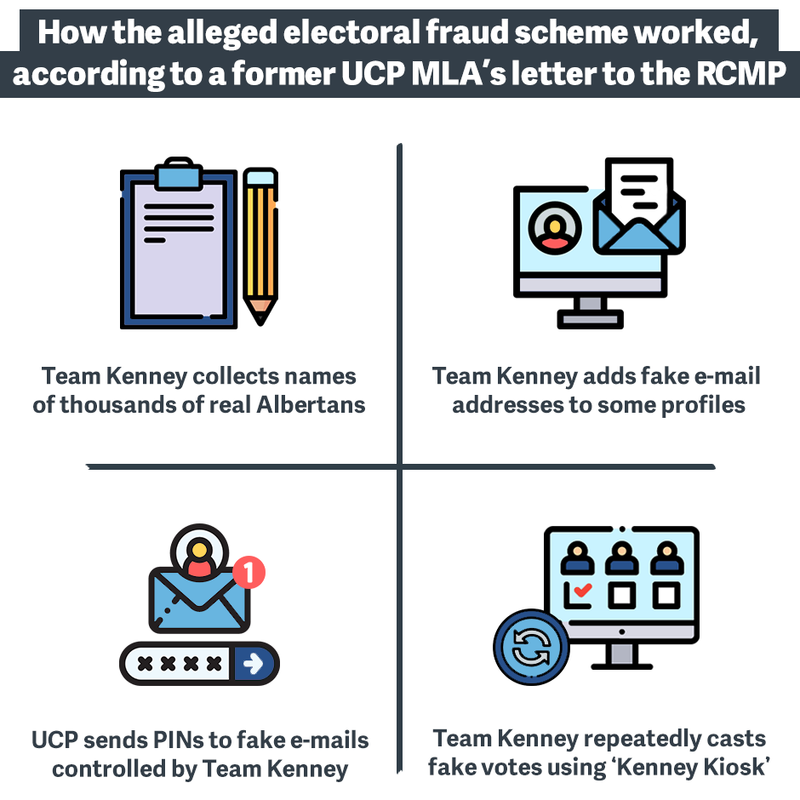 According to the letter, former MLA Prab Gill alleges Kenney’s team “intercepted” PINs needed to vote in the UCP leadership using “fraudulent e-mail addresses” and used these to cast fake votes for Kenney. Gill says volunteers collected real names from real Albertans, but phony e-mail addresses were later attached to their names. Two weeks ago, CBC News reported that a list of UCP members included names attached to “dozens” of “fake” e-mail addresses registered at domains that created between September 20 and October 13, 2017, only weeks before the leadership vote. A list obtained by PressProgress includes the names of individuals who insist they voted in the 2017 UCP leadership race, but appear attached to fake e-mail addresses registered at domains created in late September and early October 2017 through a domain service provider based in Provo, Utah. Many e-mails sent to addresses included on the list now bounce back to sender as most of the domains — such as “tikonamail.com” or “gianimail.com” — are no longer active and appear to have expired one year after they were first registered. Although the e-mail addresses included on the list are fake, PressProgress confirmed many of the names and physical addresses attached to them are quite real. Individuals at two separate residences confirmed to PressProgress they had recently been visited by RCMP investigators who asked questions on matters relating to suspicious e-mail addresses and the 2017 UCP leadership vote. Three members of UCP supporter Kanwaljit Shergill’s suburban Calgary household appear on the list connected to an e-mail address registered at “ptclmail.com,” a domain that was registered five weeks before the vote. Shergill told PressProgress she provided a statement after RCMP investigators from a “special unit” visited her home and asked her family about e-mail addresses they’d never seen before. 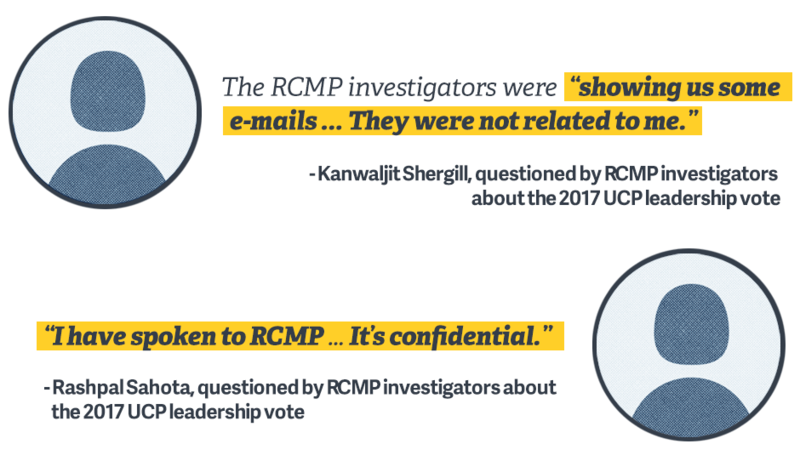 Shergill said the RCMP investigators asked her family if they “provided our e-mails” to the UCP — “we never did,” she noted. Rashpal Sahota, who appears on the list with four other family members registered under a “naneknet.com” e-mail address (registered in September 2017), confirmed he spoke to the RCMP too, but declined to comment further. Several others who live at addresses included on the list told PressProgress they cast votes in the October 2017 UCP leadership. Most indicated they cast ballots in-person at a location in Northeast Calgary. Harjeet Singh, who appears on the list along with two other household members connected to a “link3mail.com” e-mail address, said he voted in-person in Falconridge. Singh told PressProgress he has never seen the “link3mail.com” e-mail address, explaining he uses a “yahoo.com” e-mail address. 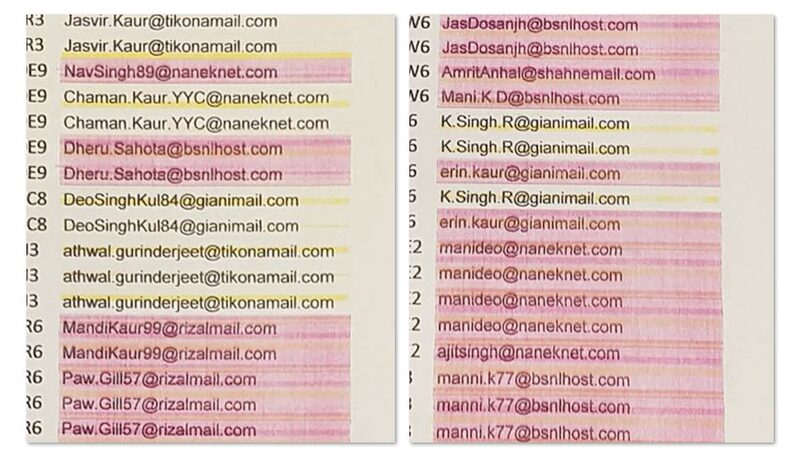 Ramandeep Singh Johal also told PressProgress he’s never heard of “bsnlhost.com” even though he and two family members are listed under that e-mail address. Five members of Karamveer Tiwana’s family are connected to an e-mail address at “gianimail.com,” an e-mail address he says he’s never seen before and insists he voted in-person for the UCP leadership too. While the rules encouraged leadership teams to “help all Electors to vote,” it appears Kenney may be the only one who set-up his own in-person voting locations. Responding to a report in February that his team used VPNs to cast multiple votes from the same computers at “Kenney voting kiosks,” Kenney suggested that this was done by “all campaigns” as a “convenience” to seniors. Kenney’s main rival, Brian Jean, fired back that his campaign “never used VPNs or voter kiosks” during the leadership vote. To set the record straight: my team never cheated, used VPNs or voter kiosks during #ucpldr race. In fact we complained to committee when a team was caught using them. @jkenney needs to retract statements made this morning. 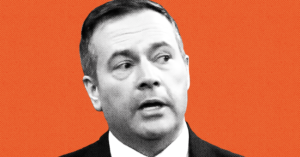 A third individual, a campaign worker for the Jason Kenney leadership campaign who describes himself as an “old-time worker for the UCP,” told PressProgress he was questioned for “20 minutes” by two RCMP investigators at a Tim Hortons in northeast Calgary on March 25. “My job was just to sell memberships, collect data, that was it,” the campaign worker explained, noting that “the only thing is sometimes I’d collect the information without e-mails” because sometimes people in the South Asian community “don’t use e-mails” or “the one guy” who is “responsible” for the family will give his e-mail address on behalf of the entire family. The campaign worker said the RCMP investigators asked him about three names: Whitney Issik, Shuvaloy Majumdar and Bianca Smetacek. Issik, who is the current UCP candidate in Calgary-Glenmore, was alleged to be the operator of a Kenney kiosk in a letter sent to the RCMP a few months ago by former UCP MLA Prab Gill. Majumdar, an executive at former Prime Minister Stephen Harper’s consulting firm, was a high-ranking member of Kenney’s leadership team and was recently named in leaked e-mails as an apparent central figure in the “kamikaze” scandal. Smetacek previously admitted she received instructions on how to use VPNs to bypass the UCP’s internal systems to prevent people from voting multiple times from a single computer, although she insisted the use of VPN software did not violate any rules in the UCP leadership race. Neither Issik nor Majumdar responded to multiple requests for comment from PressProgress. An RCMP spokesperson told PressPogress the Mounties received a correspondence from the UCP’s legal counsel, Steven Dollansky, on March 18, 2019. Harrington did not respond to multiple requests for comment from PressProgress. One “senior associate” at the small firm was David Dorward, one of Kenney’s top leadership organizers and the current UCP candidate in Edmonton-Gold Bar. 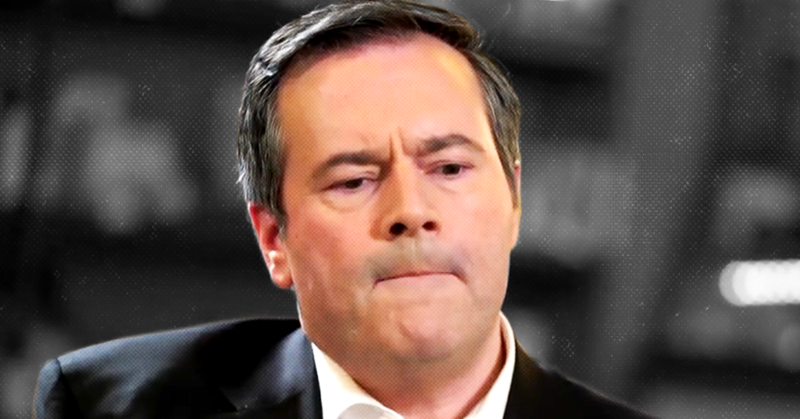 Jason Kenney’s plan to gut public funding and hand out massive corporate tax cuts would kill 58,000 public and private sector jobs in Alberta over four years — more jobs than were lost in the province following the collapse of oil prices in 2015.